General Motors announced earlier this month it was the “first automaker in North America” to use Autodesk’s “generative design” technology. According to GM, an OEM can simply give an artificial intelligence some broad instructions and turn it loose. “It uses cloud computing and AI-based algorithms to rapidly explore multiple permutations of a part design, generating hundreds of high-performance, often organic-looking geometric design options based on goals and parameters set by the user, such as weight, strength, material choice, fabrication method, and more,” GM wrote in a news release. The result might be shapes that no human could have conceived, or at least developed quickly — and which wouldn’t have been possible to manufacture without the limitless geometries 3-D printing allows. The resulting designs are submitted to a human, who decides which one would work best for the OEM. 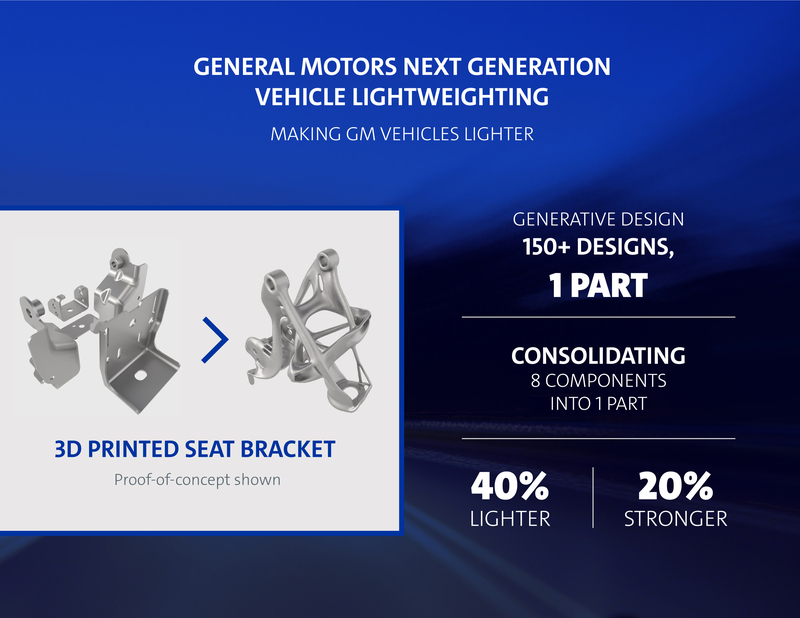 The OEM has produced a “proof-of-concept” seat bracket 40 percent lighter and 20 percent stronger than the component it replaced — and created it as a single part instead of one assembled from eight individual components. The technology might be useful for developing shapes which could work with existing manufacturing but nobody had thought of before. For example, OEMs will determine where they can cut notches into body-in-white parts to shave mass while preserving strength, and NanoSteel has discussed how changes of geometry can produce a lightweighted bumper beam. It seems like you could turn software like Autodesk’s loose on this topic if you added in parameters related to traditional part stamping, extruding, etc., and the company’s website seems to suggest AI-designed parts produced using both conventional manufacturing and 3-D printing. Under a different set of rules and AI thought process, it seems like such a piece of software could someday be a cool way for an OEM to someday rapidly develop repair procedures — for example, all the places a part might safely be sectioned. (As with the manufactured parts, you’d have to validate these through physical testing, of course.) But for now, “The technology is in its infancy stage and we have not used it to explore repair procedures,” Darovitz wrote. GM said it was the first automaker with 3-D printing capabilities, and today it has 50 prototype machines which have produced more than 250,000 trial parts over the past 10 years. 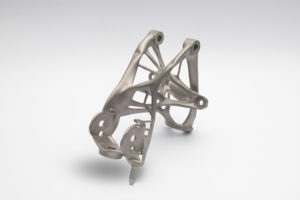 According to the OEM, the company now “has on-demand access to Autodesk’s full portfolio of software and technical specialists” as part of a multi-year deal to collaborate on materials science, 3-D printing and generative design. Though GM wrote of cutting “mass in parts where material is not required for performance,” any parts created by such an artificial intelligence still might not be repairable without instructions from the automaker. (After all, just because a part isn’t structural doesn’t mean the OEM or owner is cool with it being flimsy.) For example, could one of these “threads” on the proof-of-concept bracket be sectioned or repaired without having the porous structure fail prematurely when stressed? Without something like Autodesk, it seems like a repairer would have no idea whether a modified version of such an alien geometry would still “work” within OEM tolerances.